For the next part of my ongoing project I needed to test the GPS reciever I'm using, a uBlox LEA-M8F (M8 series chip, LEA form factor, and with frequency outputs). Since the native 30.72MHz oscillator is useless for me I'm using an external TCVCXO (temperature compensated, voltage controlled oscillator) for now, with the DAC & reference needed to discipline the oscillator based on GPS. If uBlox would sell me the frequency version of the chip on its own that would be ideal, but they don't sell to small customers. 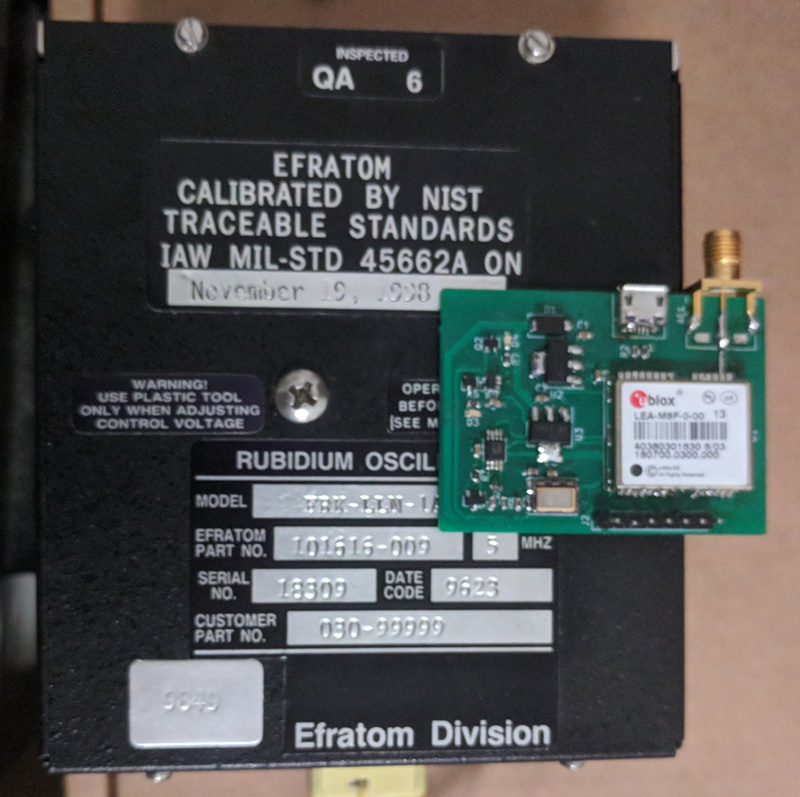 Here's a (rather modified) board sitting on top of an Efratom FRK rubidium standard that I'm going to mount to make a (temporary) home standard (that deserves a post of its own). To give a sense of scale the silver connector at the top of the board is a micro-USB socket. Although a very simple board I had a mess of problems once again, both in construction and in component selection. Unlike the PoE board from the previous post I didn't have this board manufactured. This was for two main reasons, first, the uBlox module isn't available from Digikey, so I'd still need to mount it by hand. The second, to fit all the components this board has a much greater area, and since the assembly house I use charges by board area (regardless of the number or density of components) this would have cost several hundred dollars. In the end, this might actually have been the sensible way to go. By chance I'd picked up a new soldering iron at the same time these boards arrived, a Hakko FX-951 knock-off and gave it a try. Whilst probably an improvement over my old Hakko FX-888 it's not a great iron, especially with the knife tip it came with, and certainly nowhere near as nice to use as the JBC CD-B (I think that's the model) we have in the office lab. It is good enough that I'm probably going to buy a genuine Hakko FM-203 with an FM-2032 precision tool for the second port. The big problem I had hand-soldering the boards was bridges on several of the components. Not just the tiny (0.65mm pitch, actually the *second largest* of eight packages for that chip) SC70 footprint of the PPS buffer, but also the much more generous 1.1mm pitch of the uBlox module. Luckily solder wick fixed most cases, plus one where I pulled the buffer and soldered a new one more carefully. I ended up buying the wrong USB connectors for the footprint I chose (the same thing happened with the first run of USB-C modules I did in 2016), and while I could bodge them into use easily enough there wasn't enough mechanical retention so I ended up ripping one connector off the board. I ordered some correct ones, but because I wasn't able to wick all solder off the pads they don't attach as strongly as they should, and whilst less fragile, are hardly what I'd call solid. The surface mount GPS antenna (Taoglas AP.10H.01 visible in this tweet) I used was 11dB higher gain than the antenna I'd tested with the devkit, I never managed to get it to lock while connected to the board, although once on a cable it did work ok. To allow easier testing, in the end I removed the antenna and bodged on an SMA connector for easy testing. When selecting the buffer I accidentally chose one with an open-drain output, I'd meant to use one with a push-pull output. This took quite a silly long time for me to realise what mistake I'd made. Compounding this, the buffer is on the 1PPS line, which only strobes while locked to GPS, however my apartment is a concrete box, with what GPS signal I can get inside only available in my bedroom, and my oscilloscope is in my lab, so I couldn't demonstrate the issue live, and had to inject test signals. Luckily a push-pull is available in the same footprint, and a quick hot-air aided swap later (once parts arrived from Digikey) it was fixed. Yes I can solder down to ~0.5mm pitch, but not reliably. More test points on dev boards, particularly all voltage rails, and notable signals not otherwise exposed. Flux is magic, you probably aren't using enough. Although I've confirmed all basic functions of the board work, including GPS locking, PPS (quick video of the PPS signal LED), and frequency output, I've still not yet tested the native serial ports and frequency stability from the oscillator. Living in an urban canyon makes such testing a pain. Eventually I might also test moving the oscillator, DAC & reference into a mini oven to see if a custom OCXO would be any better, if small & well insulated enough the power cost of an oven shouldn't be a problem. Also as you'll see if you look at the tweets, I really should have posted this almost a month ago, however I finished fixing the board just before heading off to California for a work trip, and whilst I meant to write this post during the trip, it's not until I've been back for more than a week that I've gotten to it. I find it extremely easy to let myself be distracted from side projects, particularly since I'm in a busy period at $ORK at the moment.